Houston Discovery Green Park – This is the Houston Discovery Green Park from this aerial vantage point which let us create this great pano overview of this area. 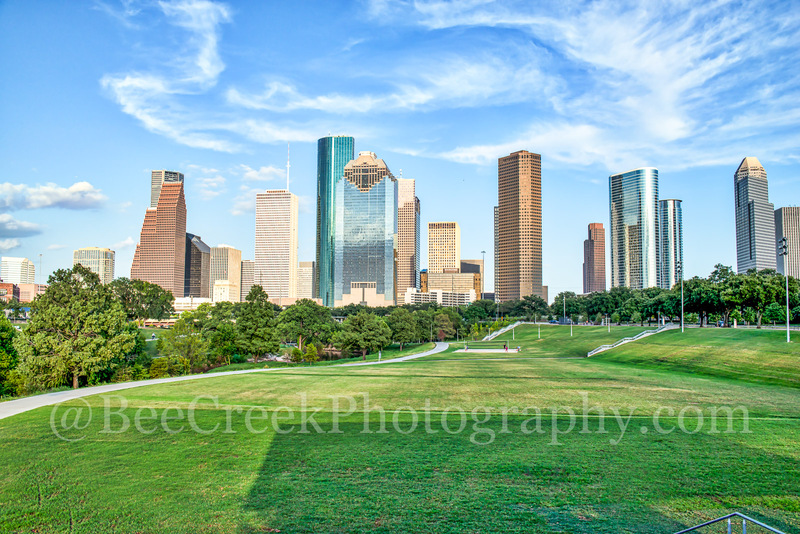 The Discovery Green park is 12 acreas right in the heart of downtown Houston across from the convention center, Toyota Center and Minute Maid Park a few blocks away. There are also plenty of places to stay in the area with the the Hilton Americas and the new Marriott Marque to name just a few right across from the park. We loved that from this vantage point you could also see the George Brown Convention Center the high rise hotels and condos in the area along with the Kinder Lake and the childrens spray area for cooling down along with other areas of the park. 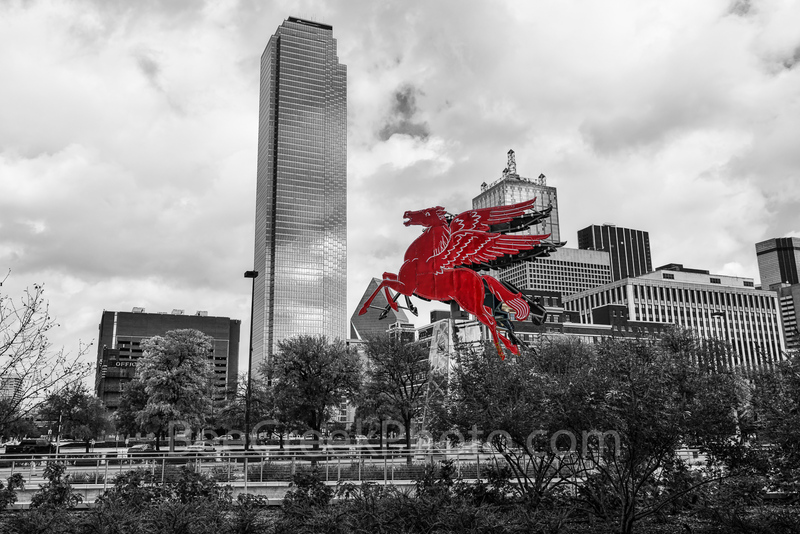 Along with the George Brown Convention Center they recently added Avenida Plaza and the Wing Over Water water sculptuer so you can spend a day just in this area of downtown Houston. There is parking garage under the park along with many other places to park and you can spend a day on Kinder lake kayaking or enjoy many movies, and music event at the Discovery Green free events while your here. The convention center new Aveida also is a new place to come and listen to music. While we were there people were dancing on the Aveida plaza to the latin beat of a Brazilian group next to the new water feature Wing Over Water right on this new area. There is plenty to do, see and eat in the area so you don’t have to go far. The Discovery Green park in downtown host over 600 free events for all ages every year you can’t beat that. Discovery Green Park From Above – Discovery Green Park on a beautiful summer day from above with nice white puffy clouds as people mingle through out this city park. You can see people in kayaks on KInder Lake, some just taking a stroll and some stop for a bit to eat at the many restaurant in the area. The George Brown Convention Center along with the Hilton Hotel can be seen in the image along with the many trees in the park to add shade for those enjoying the area. If your coming to Houston this is a great park to visit on your travels. There are all kind of things to do. 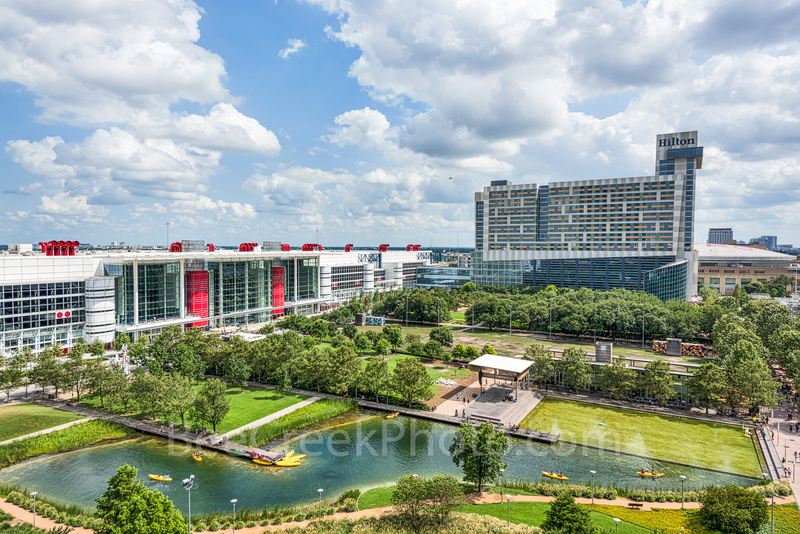 Posted in Photo of the Day and tagged aerial, amptheater, Avenida Plaza, Embassy Suites, George Brown Convention Center, Hilton, hotels, Houston, Houston Discovery Green Park, Kinder Lake, overview, pano, panorama, spray park, toyota center on August 14, 2018 September 25, 2018 by Bee Creek Photo. Austin Aerial Skyline Twilight View – Austin Aerial skyline view at Twilight taken from a birds eye view. This is another Austin skyline aerial image of the Austin twilight view looking down Lady Bird Lake with the city modern high rise buildings along the shoreline of the lake and looking north over IH35 where you can see the UT stadium and Erwin Center in the distant view. You can see Austin tallest building the Austonian which for a few months longer will hold that title till the Independent is completed sometime before the end of the year. It has been hard to capture images of Austin skyline from anywhere along the hike and bike trail because they are constantly adding new building along the shoreline. About the time you think they are done new cranes show up. Just recently found out that we will have two new buildings along the town lake shoreline once more and they will be taller than the Independent so its title will not last long. Just like all good things they don’t last long you can barely see the top of the Frost building, at one time it was the tallest building in the skyline. The cityscape has been constantly changing for years and I guess until all the land is gone it will continue. 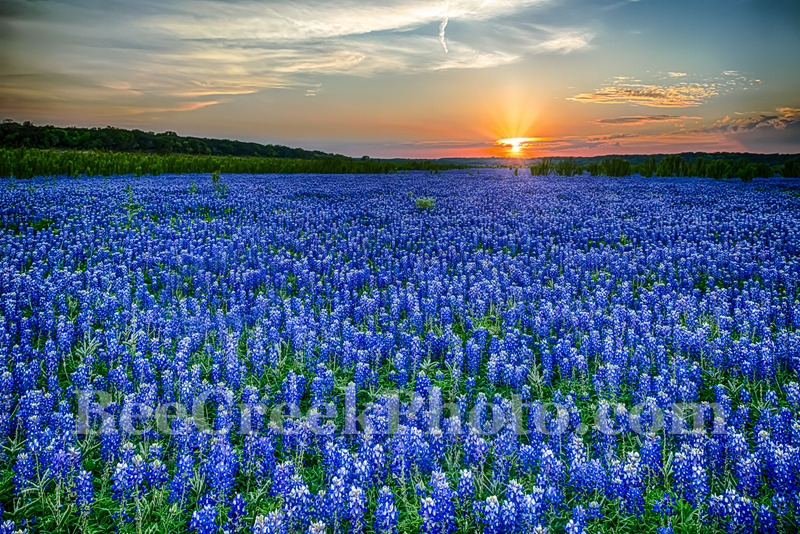 Actually from this spot in the 70’s you had a straight on view of the Texas Capital those days have been gone for many years now. Austin Skyline View – Austin skyline view at twilight taken from a birds eye view through the trees. 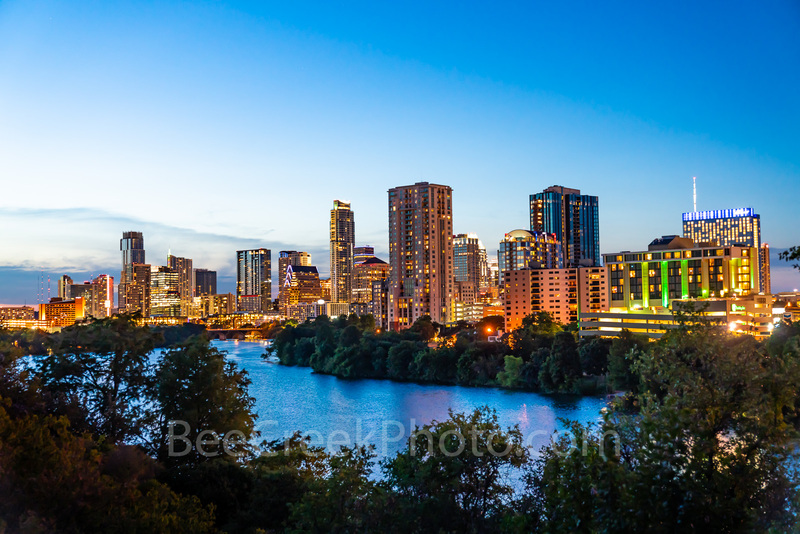 This is another image of the Austin skyline at twilight looking down Lady Bird Lake with the city high rise buildings along the shoreline of the lake. You can see Austin tallest building the Austonian which for a few months longer will hold that title till the Independent is completed sometime before the end of the year. It has been hard to capture images of Austin skyline from anywhere along the hike and bike trail because they are constantly adding new building along the shoreline. About the time you think they are done new cranes show up. Just recently found out that we will have two new buildings along the town lake shoreline once more and they will be taller than the Independent so its title will not last long. Just like all good things they don’t last long you can barely see the top of the Frost building, at one time it was the tallest building in the skyline. The cityscape has been constantly changing for years and I guess until all the land is gone it will continue. 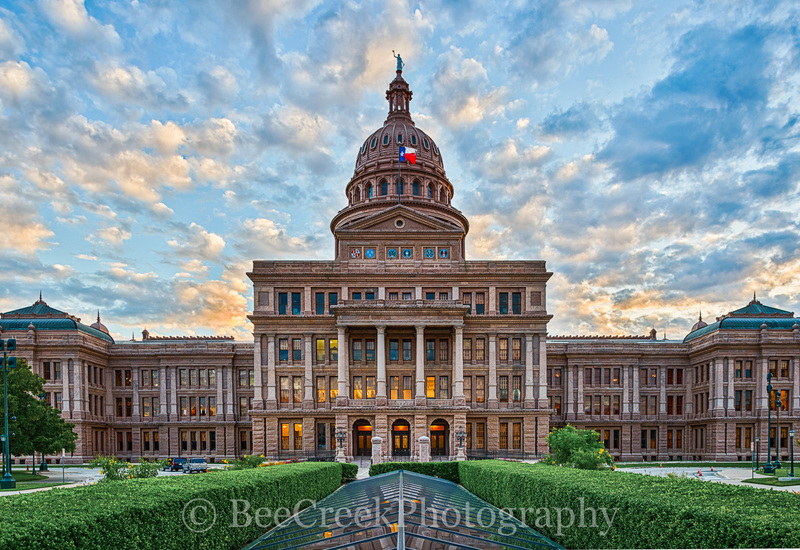 Actually from this spot in the 70’s you had a straight on view of the Texas Capital those days have been gone for many years now unless you go up. Posted in Photo of the Day and tagged aerial, architecture, Austin, Austin Aerial skyline, Austin Aerial Skyline Twilight View, Austin skyline, boardwalk lights, buildings, dark, drone, Erwin Center, Frost, high rise buildings, IH35, Independent, Lady Bird Lake, lake, modern, night, shore, shoreline, texas capital, twilight, UT on August 5, 2018 January 14, 2019 by Bee Creek Photo. Austin Skyline at Twilight Panorama – Texas Skylines Prints and Canvas – Austin skyline at Twilight panorama taken from a birds eye view. This is an aerial image of the Austin skyline at twilight looking down Lady Bird Lake with the city high rise buildings along the shoreline of the lake and looking north over IH35 where you can see the UT stadium and Erwin Center in the distant view. You can see Austin tallest building the Austonian which for a few months long will hold that title till the Independent is completed sometime before the end of the year. It has been hard to capture images of Austin skyline from anywhere along the hike and bike trail because they are constantly adding new building along the shoreline. About the time you think they are done new cranes show up. Just recently found out that we will have two new buildings along the town lake shoreline once more and they will be taller than the Independent so its title will not last long. Just like all good things they don’t last long you can barely see the top of the Frost building, at one time it was the tallest building in the skyline. The cityscape has been constantly changing for years and I guess until all the land is gone it will continue. Actually from this spot in the 70’s you had a straight on view of the Texas Capital those days have been gone for many years now. Austin Downtown Night Pano – Another Austin Downtown Night pano taken from a birds eye view. This is an aerial image of the Austin skyline at twilight looking down Lady Bird Lake with the city high rise buildings along the shoreline of the lake in the downtown area and also looking north over IH35 where you can see the UT stadium and Erwin Center in the distant view. You can see Austin tallest building the Austonian which for a few months longer will hold that title till the Independent is completed sometime before the end of the year. It has been hard to capture images of Austin skyline from anywhere along the hike and bike trail because they are constantly adding new building along the shoreline. About the time you think they are done new cranes show up. 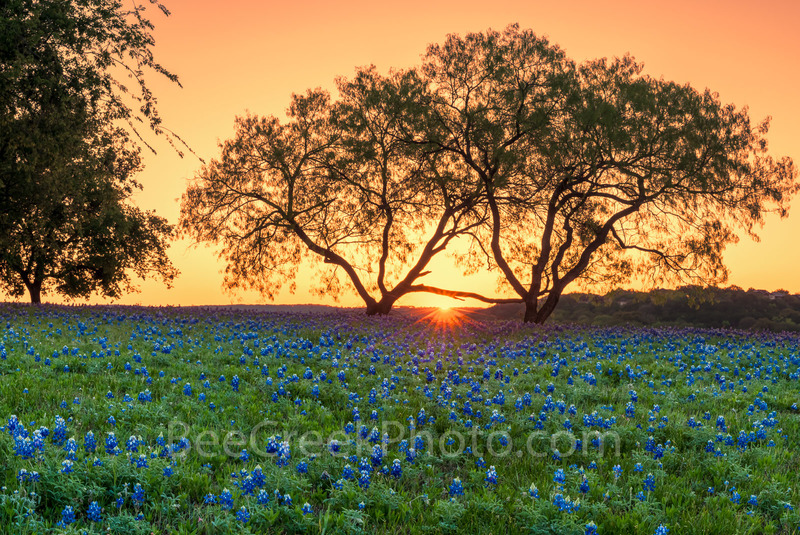 Just recently we found out that we will have two new buildings along the town lake shoreline once more and they will be taller than the Independent so its title will not last long. 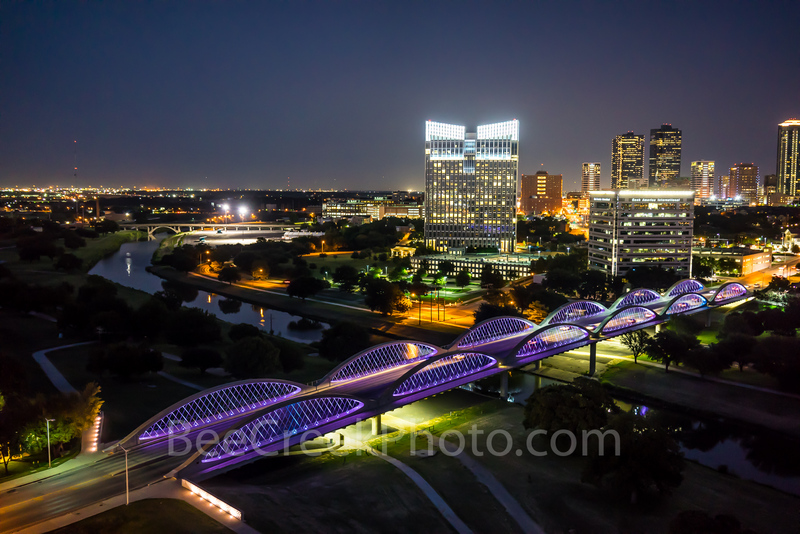 Posted in Photo of the Day and tagged aerial, architecture, Austin, Austin architecture, Austin skyline, Austin Skyline at Twilight Panorama, boardwalk lights, buildings, dark, drone, Erwin Center, Frost, high rise buildings, IH35, Independent, Lady Bird Lake, lake, night, shore, shoreline, texas, texas capital, twilight, UT on August 2, 2018 September 18, 2018 by Bee Creek Photo.